Here is a bunch of photo highlights from the whole trail I was finally able to pull off my nicer camera. Enjoy! Lucky, Carrot and Bear in the 100 Mile Wilderness. Southside and Carrot and Bear. Extreme river crossing by Emily. Emily making her way through the Mahoosuc Notch, AKA the toughest mile. 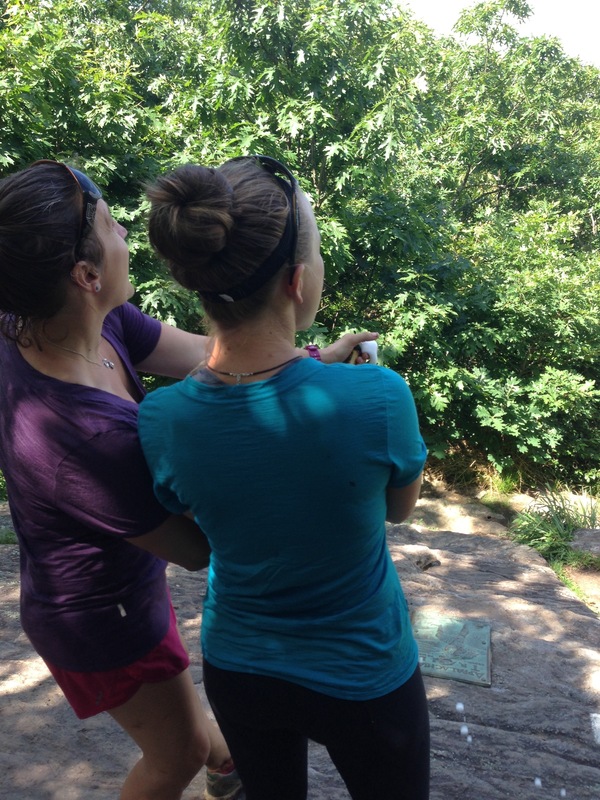 Jen and Emily through the Notch in Maine! Camped out on Wildcat Tower, NH. Jen crossing a bridge in NH. Emily and Alison the pig. One of our favorite meals- BBQ chicken pizza outside Belleview Creamery, PA. The splinter after exiting Jen’s thumb after 7 weeks. 1,000 mile mark in PA! Bags hanging in the shelter in PA.
We are going this way! At the PA-MD line at 3am, starting our 42 mile day through Maryland. Alabama, Lucky and Carrot at the end of the day in West Virginia! Our boys Gritz and Pace showing their Blaze Fashion. Carrot and Lucky loving the Shenandoah in October. The return, April 16th at the same spot! Afternoon shelter napping by Carrot. 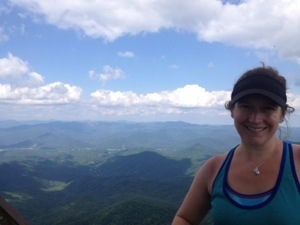 Lucy loving the Blue Ridge Mountains, VA.
Jen enjoying a Blue Ridge view. 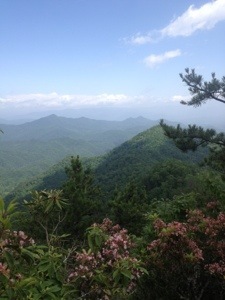 Lucky on McAfee Knob, VA.
Lovely laurels in southern VA.
Em and Jen loving the waterfalls. Lucky with 500 miles left! 500 miles left celebration by Carrot! Emily making friends with the wild ponies. Beautiful waterfall. Probably Laurel Falls. First time crossing in NC! Old shoes (475 miles on them) and new shoes we received in Tennessee. Emily trapped in the bear caged Davenport Gap Shelter in the Smokies, NC. Waking up Ebeneezer Scrooge, AKA Lucky. Amazing tree roots in GSMNP. Lucky and Carrot in GA.
Lucky modeling the latest Frogg Togg fashions. Emily enjoying our wine Lead Dog carried for us the final 2 days. We have been a bit cautious when using the word “almost”. Starting 400 miles back people kept telling us we were “almost” done. We would always smile and say “well, we know a lot can happen in (insert # here) miles”. The last few days have been a prime example of that. 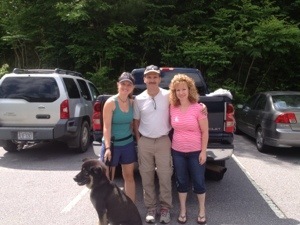 We had to pick up our food drop Monday before leaving Fontana Dam. Jen lost the Rock/Paper/Scissors game and had to shuttle into the village early for the box. It was raining, of course, and we had gotten up early to get to the PO when it opened. Jen left for the shuttle and I continued to fill water and break down our camp. I had our stuff ready to go and just needed Jen to return with the food for our packs so I read while I waited, and waited. Soon I decided to heat up water for coffee and wait some more. It was pouring rain. Finally at 1145 poor Jen returned to the shelter looking like an angry drowned rat. When she arrived at the village, after waiting for a shuttle that never came and taking a ride from a random resort employee, she found that we were in resort summer hours and the PO did not open until 1145. So she waited… And waited. They were nice enough to open “early” at 1130 for her to get our package and get back to the trail. By the time she got back to the shelter neither of us were in the mood to hike out into the rain, so we took a second zero day. The good thing about a second zero day is that you are ready to hike when the time comes. We were getting antsy and were excited to head out for a long day. The other nice part was that we headed out into a sunny day. The weather was warm and humid, but we were not complaining. Sun = Happy Hikers. 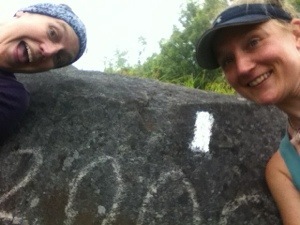 This day saw us 18.2 miles further down the trail. There were many short steep climbs, but with the sun shining we were just happy to walk. At the end of the day we set up camp in one of the many gaps, and proceeded to cook dinner. Unfortunately the wet weather has brought in lots of gnats. It wasn’t long before they set their sites on us and the dog. Poor Georgy had to fend for himself as we sought shelter in our trusty tent. On the twelfth we walked down into the NOC. A large outdoor center on the Nantahala river that specializes in rafting and kayaking. We were very happy for we ate BBQ and drank beers. After lunch we secured our status as professional hobos outside of the outdoor retailer. We rested in their display hammocks and charged our phones in the outside outlets for about, I don’t know, three hours. It was great. Bear laid on the cool concrete near the door so he got wafts of AC as shoppers went in and out. As I said, professional hobos. Once digested we walked another 0.8 miles to the nearest shelter to sleep for the night. We woke at our normal time, 8-8:30, and started hiking. The morning was sunny, but very windy. We snacked at an overlook and were able to get phone service. After looking at the weather it became obvious that the wind was moving a storm our way. We continued to walk and the sky changed quickly. Soon it was that sickly green you witness before a hurricane or tornado. The wind was strong and our adrenaline spiked when a tree crashed down to the right of the trail. That wood cracking was enough to quicken our pace along to the next shelter. There we decided to just stay the night and make up the miles in the morning. 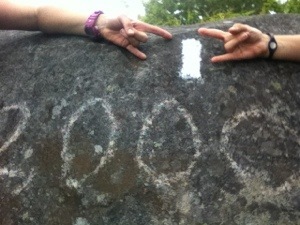 June 14, up early and hiking before 8am! It was a clear, cool morning and the sun was starting to shine. We walked easily and covered the miles quickly. We met a father and son around lunchtime who shared some food with us. Jason and Jeremy were out to cover a section of the trail. When we ran into them again a few miles down the trail they offered us a ride into town! Traci and Zach, mom and son, made up the rest of this fabulous family. After not only giving us a ride to pick up our box and taking us to the hotel, they insisted on picking us up in the morning to take us back to the trailhead. 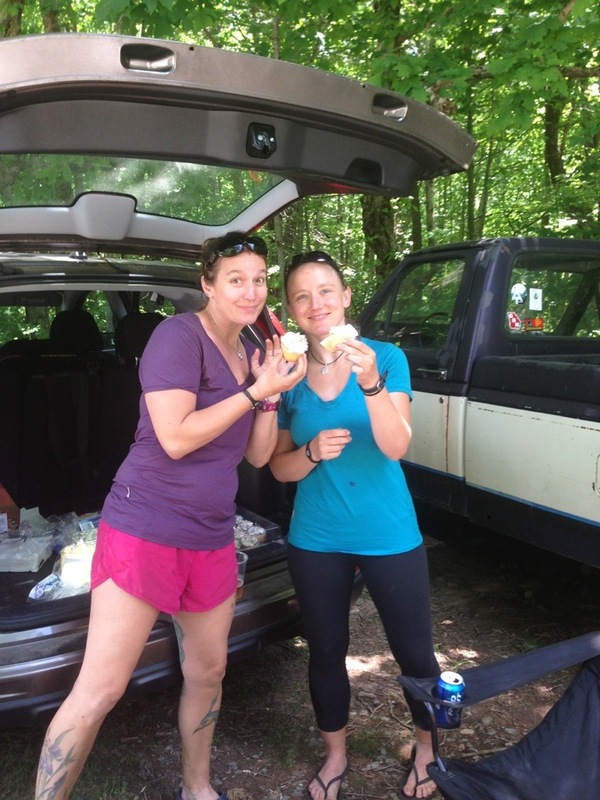 Trail Angels! We are so grateful for their generosity. Once again it is hard to find the words for how thankful we are for their acts of kindness. Franklin was the kind of town where cat calls are still whooped out of windows of trucks and hitching made me nervous. Fast forward a few days of walking and we are continuing to make great time. We are looking forward to seeing our families in less than a week! We have crossed into GA and have less than 60 miles to go. I think we are almost ready to use the word almost. However, we are still cautious. Maybe we will say “almost” when have less than a mile to go. Maybe when there are just a few steps left. It is a tricky word and our emotions and exhaustion level change by the day, sometimes hour. I can say that we are ready to see our families and our significant others and look forward to sharing this massive achievement with those who have helped make a lifelong dream a reality. It has been a long, wet week for Lucky and I in Great Smoky Mountain National Park (GSMNP/Smokies). 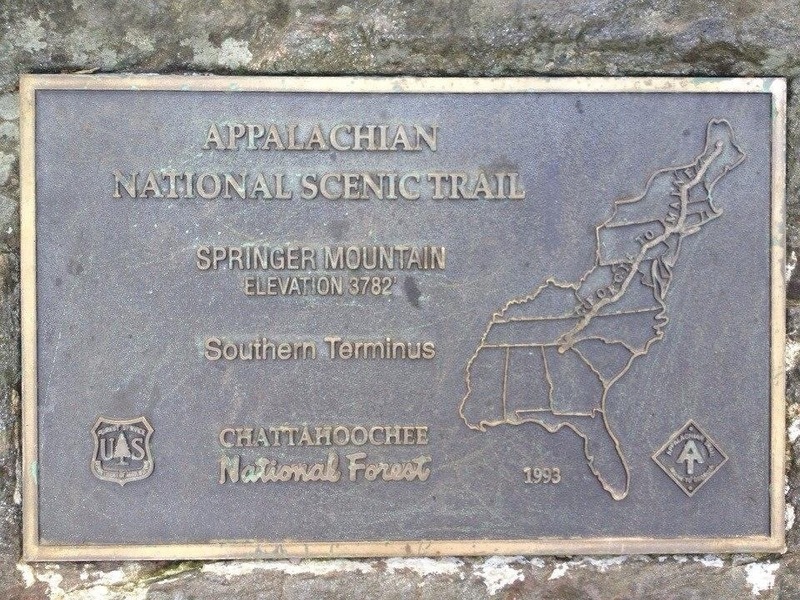 We had been anticipating this 72-mile section of trail for many states as Northbounders had recounted their tales of difficulties in the Smokies. Cold temperatures, snow, endless wet days, and lots of climbing combined with the park’s “No Dog” policy made us dread what was coming. So after dropping Georgy off with Lida from Loving Care Kennels (who picked him up at the trail side before entering the park), we headed up into GSMNP. We stayed the first night at Davenport Gap Shelter, which stood out as the only shelter in the park that is still caged. This is suppose to prevent bears from entering the shelter, but ends up just making us humans feels like we are on display in the zoo. 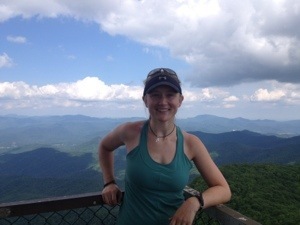 Day 2 we hiked 14.8 miles to Tri-Corner Knob Shelter, the most remote shelter in the park. We enjoyed our only day of sunshine of the week and made it to the full shelter before the evening rains began (which would continue every night the rest of the week). We made our current favorite dinner (Thai peanut pasta) and bedded down in the spacious shelter as our sheltermates kept the fire going in the shelter’s fireplace. Day 3 was our shortest day of the week, 12.6 miles to the most popular shelter in the park- Icewater Spring Shelter. Being forced to walk shelter to shelter was one of the other frustrating rules of the park. Everyone has to stay at shelters each night and must have a permit for each specific shelter (luckily thru-hikers are exempt from the second part). Since we had a shorter day we decided to “grease the groove”, which involved doing push-ups and planks every hour on the hour to improve our fitness. Though it was tough, it really broke up the day! At Icewater we got to meet some great folks, including a couple of married nurses who gave great career advice. We also met some of the coolest kids ever! Amelia (10 years old), her brother Brody (8 years old) and their friend Porter (also 10 years old) were on a camping trip with their dad’s Jason and Adam. 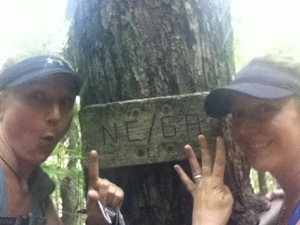 The 5 of them were hiking the 72 miles of the AT in the park and were doing the same mileage as us. These kids were doing 15 miles a day with few complaints and an awesome attitude. 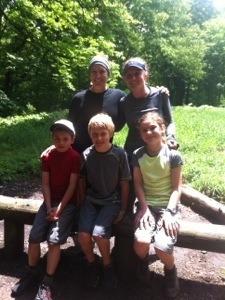 They were definitely the most hard-core (as well as the most fun and well-behaved) kids we have met on the trail! 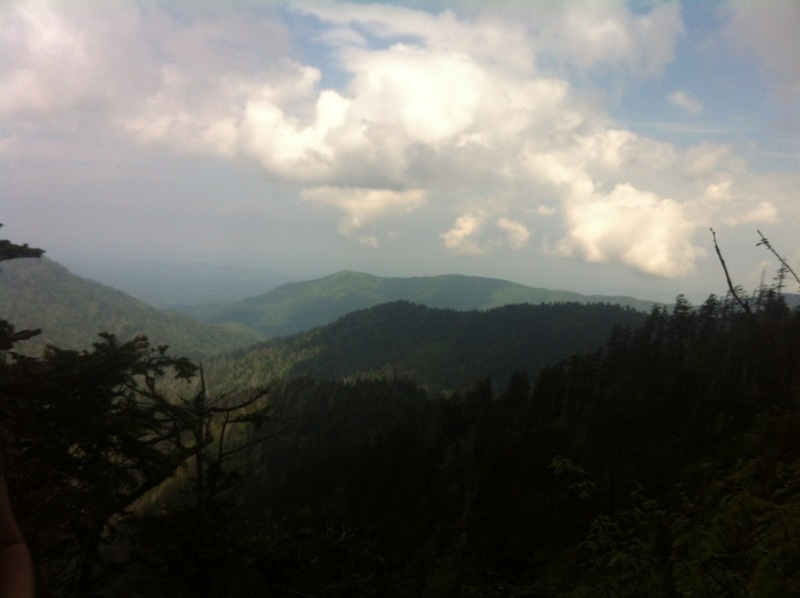 Day 4 we knocked out 15.5 miles, crossing our first two big milestone of the smokies- climbing Clingman’s Dome (the highest point of the AT at 6,643 feet) and having less than 200 miles left! Both were exciting and we were also able to sneak into the shelter minutes before the evening’s deluge of rain began. Day 5 was our longest day in the park, 17.5 miles to Mollie’s Ridge Shelter. We enjoyed our final lunch with the awesome kids and dads before climbing to the top of Rocky Top and a HUGE milestone- 2,000 miles completed! 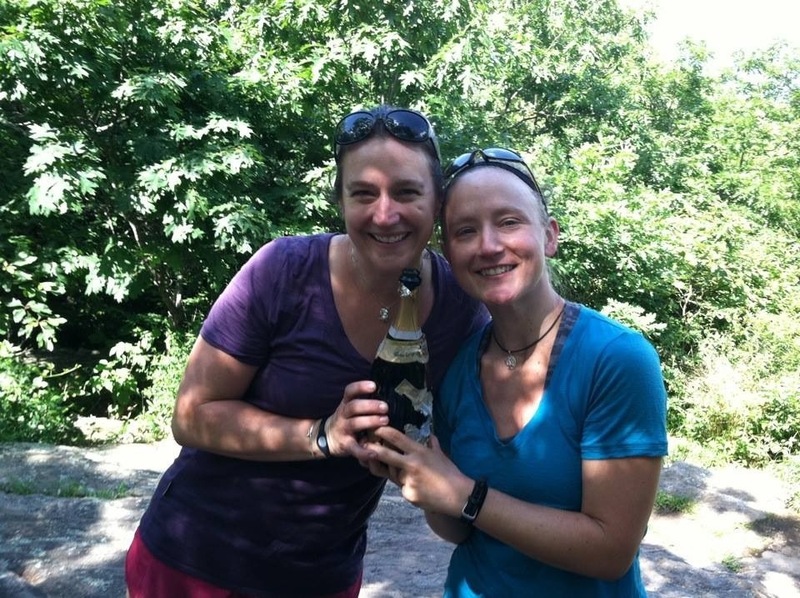 A photo shoot ensued, along with calls and texts home to share our accomplishment. As usual, the trail made sure we knew our place and rewarded us with an incredible lightening storm and 4 inches of rain in under an hour. Needless to stay we looked like wet rats when we entered the full shelter too late. Thankfully everyone welcomed us to set up our tent in the cooking area and we were able to have a dry night despite the endless rain. Today was day 6, and we exited the park with glee. We finished the last 10 miles in under 4 hours, leap frogging with a group of Sierra Club members who had been very sweet to us, providing us with morning coffee and even hanging our bear bag in the rain! 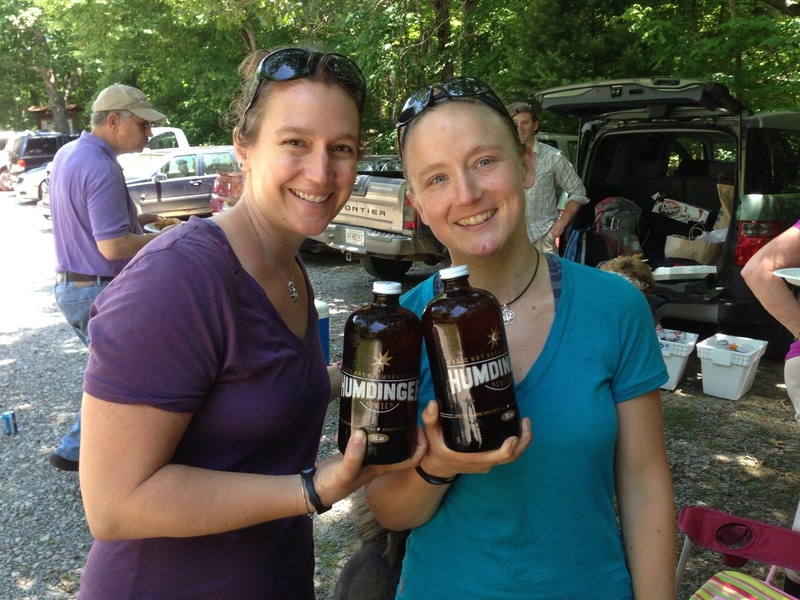 The kindness of strangers never fails to warm our hearts and every moment of trail magic means a lot to us. The final amazing moment of the week came when Lida returned my gorgeous boy to us- a happy Bear, groomed for the summer. Now all three of us can continue a Smoky-free adventure for the last 165 miles! 1) Ear plugs- After many a sleepless night in the shelters with snoring hikers and loud early morning risers, We realized the importance of ear plugs. Lucky and I pop them in early and enjoy the blissful peace of muffled noises we can’t quite decipher. Our quality of sleep in shelters went through the roof. 2) Eye mask- This one closely follows #1, this time allowing us to get to sleep before sunset and stay asleep after sunrise. I use a bandana and Lucky uses a Buff. 3) Fruit snacks- We eat these constantly throughout the day. They provide quick bursts of energy while our bodies digest the protein bars, and they are delicious. Also, they have 100% of your vitamin C-bonus! 4) Visor- This one provides a duel purpose- it not only protects from the sun (so you can send expensive sunglasses home), but keeps the rain out of your eyes as well. Love it. 5) Benedryl/melatonin- These have become begrudging essentials to our trail life. While we would love to be able to sleep well without them, after years of nightshift it just isn’t possible. The extra help these sleep aids provide is priceless! 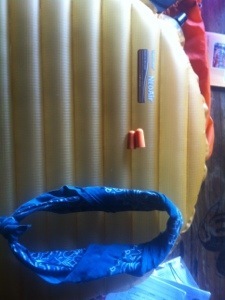 6) Thermarest Neoair- This is the last sleep essential, but a huge one. It is expensive ($160) and worth every single penny. It provides warmth and an incredible 2+ inch barrier from the ground. We have slept the whole night on huge roots and not even noticed! 7) Platypus- While the name brand isn’t necessarily important, Platypus is making a great hydration bladder with a zip closure. 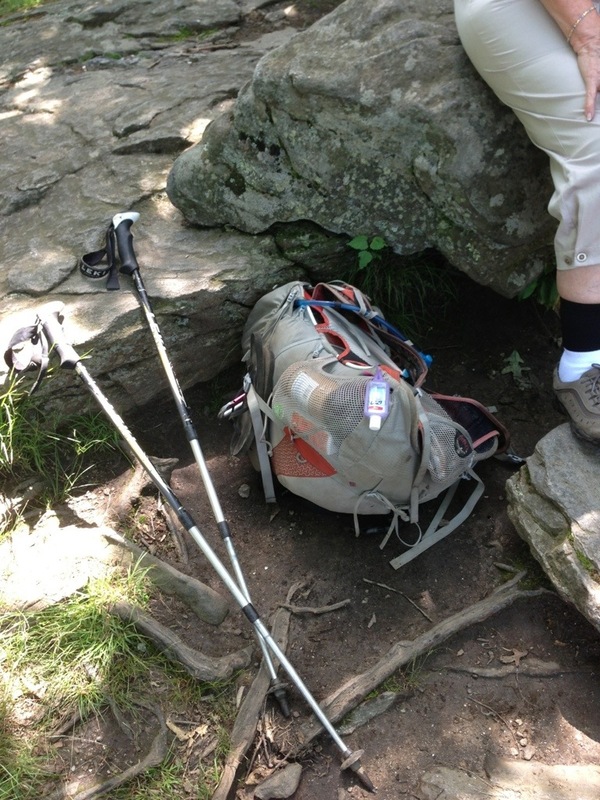 Having a straw available with water at all times makes hydration a lot simpler when you are hiking all day long. 8) Drink mixes/Coffee- While we try to drink as much water as we can, eventually we need some extra energy or electrolytes. I have tried to go caffeine free in the backcountry in the past and it was not worth it. Instant coffee in the morning and caffeinated energy drinks in the afternoon improve our quality of life tremendously! 9) Compactor bag- After many weeks of rain, keeping the inside of our backpacks dry has become key. We line our packs with heavy duty trash/compactor bags and it keeps everything inside completely dry. Amazing! 10) Dry sleep clothes- This one goes along with #9. After being soaked to the bone for 8-12 hours in the rain, putting on dry clothes to sleep at night makes all the difference. Essential!! !